Facts change all the time. Smoking has gone from doctor recommended to deadly. We used to think the Earth was the center of the universe and that Pluto was a planet. For decades, we were convinced that the brontosaurus was a real dinosaur. In short, what we know about the world is constantly changing. But it turns out there’s an order to the state of knowledge, an explanation for how we know what we know. Samuel Arbesman is an expert in the field of scientometrics—literally the science of science. Knowl­edge in most fields evolves systematically and predict­ably, and this evolution unfolds in a fascinating way that can have a powerful impact on our lives. Arbesman takes us through a wide variety of fields, including those that change quickly, over the course of a few years, or over the span of centuries. He shows that much of what we know consists of “mesofacts” - facts that change at a middle timescale, often over a single human lifetime. Facts change. Some do so faster than others. Likewise some facts are more persistent than others, no matter if they're outdated or not. 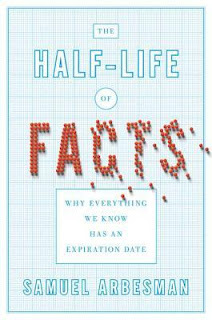 In The Half-Life of Facts Samuel Arbesman sets out to show that facts change in recognizable patterns and not as arbitrarily as it sometimes appears to be. However, this book is not just about how facts change, but even more so about how knowledge spreads and progresses, and how we organize, interpret and adapt to it. Powerfully written, and fortunately not heavy on numbers and statistics, I found this treatise incredibly fascinating. The author allows valuable insight into the world of facts - from the role measurement and error play to the importance of so-called hidden facts, and much more. Highlighting mankind's journey of discoveries throughout the centuries, Arbesman led me to a deeper understanding of the constantly changing landscape of facts. Facts are providing a sense of control, but can we really ever be in control in this constant whirlwind of change? And why are so many maintaining an attitude of refusing to deal with change? Of course, the speed in which we gather new facts, makes you wonder whether we will ever reach a plateau and whether there will be no new things left to find. For now it seems the more we learn, the more new things we discover. Those will be declared facts until they reach their "expiration date". 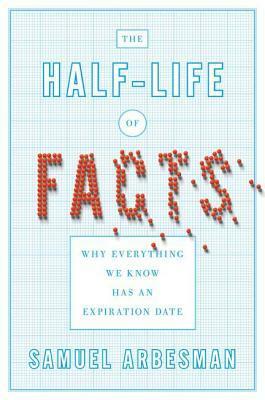 In short: Insightful journey into the world of ever-changing facts!